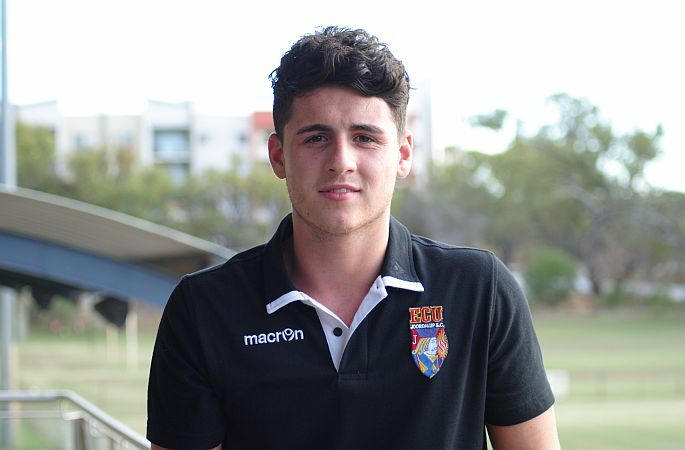 With the leagues regulations in the PS4 NPLWA, clubs can only have two visa players, this meant the club has had to make some hard decisions within their squad and it has seen Welsh defender Joseph Jones leave the club. Jones, known as JJ to everyone at the club, will also coach his last Under10’s game on Sunday, before he flies off to Bali for a holiday, followed by a longer journey to Cancun Mexico for a well-earned rest. Jones, a former Swansea City trainee, joined ECU for one season and has enjoyed the highs and lows of First team football and coaching the ECU Under 10’s. Unfortunately it was always going to come to a premature end and First team coach Dale McCulloch was very appreciative of the stint carried out by the defender. “JJ was outstanding for us and we’d like to thank him for his hard work during his time here,” he said. “As the transfer window approached the coaches had a chat and we thought we were lacking something in the middle of the park and when Kevin Moon came available, and after we signed Rikki Smith at the back, we had to make the hard decision. That initially meant the end of JJ’s First team career at ECU, although he continued to enjoy success coaching with the U10’s. As that now comes to an end, ECU are delighted to announce that Kevin Moon will take over the reins as Under 10’s coach and hopefully continue the fine work done by Joseph. The former Raith Rovers player, who also played over 100 games for St Johnstone certainly has the experience and his professional attitude will continue JJ’s fine work. We would like to take this opportunity to wish Joseph and Ellie all the best in their future endeavors. Enjoy the holidays!